How can I tell what version/build of QuoteWerks I have? In QuoteWerks select the Help->About menu. 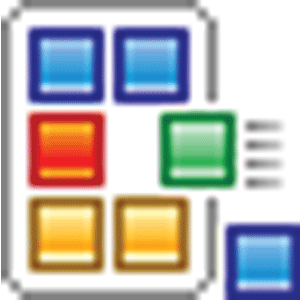 The version and build will be located under the logo in the orange box. How can I obtain the latest update of QuoteWerks? To install the latest update, you need to be current on your maintenance, then you can download the latest update from Updates page. How do I install QuoteWerks to run on another workstation? How do I move my installation to another computer/server/location? Is the version of my integrated application supported by QuoteWerks? 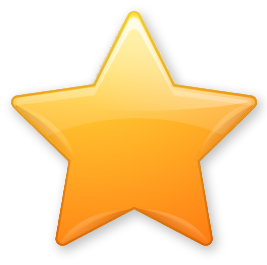 You can submit feature requests through our forum. You will need to sign up for a forum account. The power of the desktop, the portability of the web™ Request a Trial for QuoteWerks Web. Our Fast-track Overview is a great way to quickly find information you are looking for. 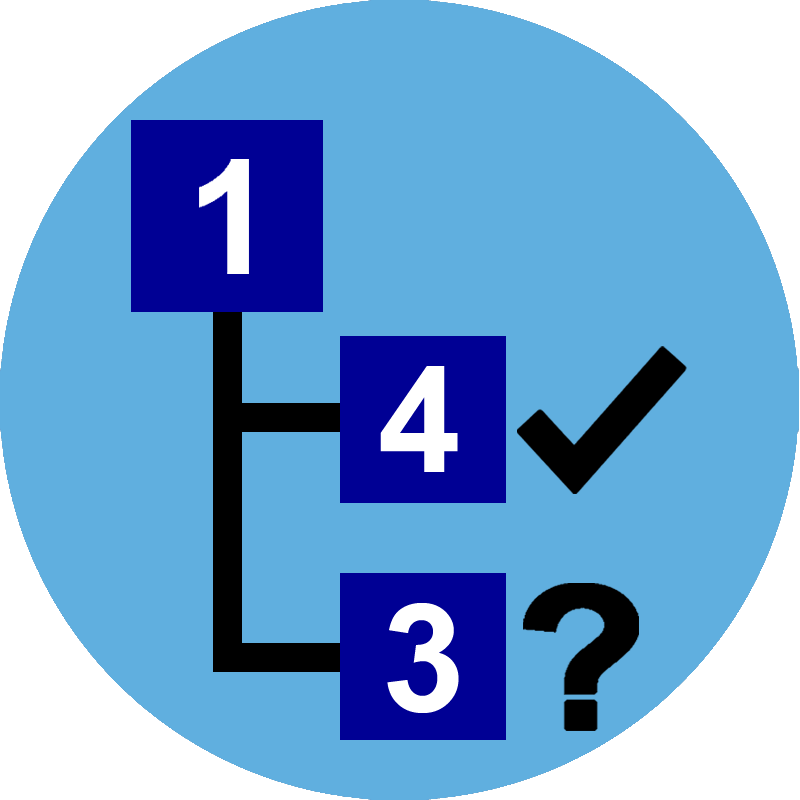 Our help System is a great way to quickly find information you are looking for. 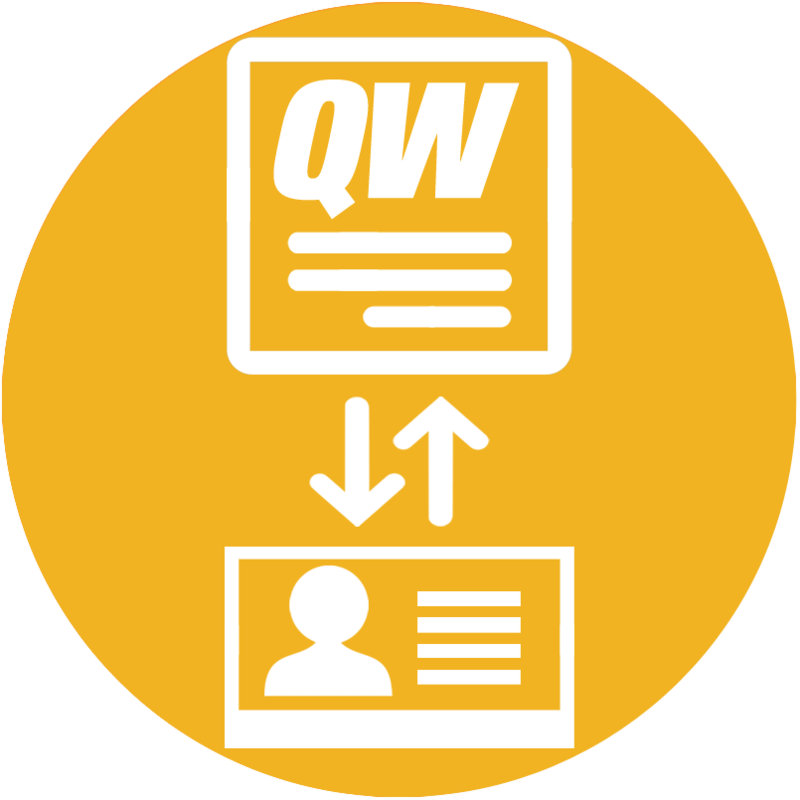 We offer numerous Paid Training options to help you maximize your setup and proficiency of QuoteWerks! 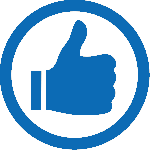 Visit our Support Page for details on our support offerings and how to contact support. Visit our Events Page to learn about QuoteWerks regional trainings, Community, and industry events we will be attending. Build Release: v5.4 Build 3.12. Some Highlight features are Zoho CRM Integration, Documents Bar, Document Side-by-Side, Autosave interval setting, and more. See the complete list of features. Build Release: v5.4 Build 2.02. Some Highlight features are SugarCRM bi-directional Datalink, Purchasing Enhancements, Autotask link to QuoteWerks Web Documents, and more. See the complete list of features. 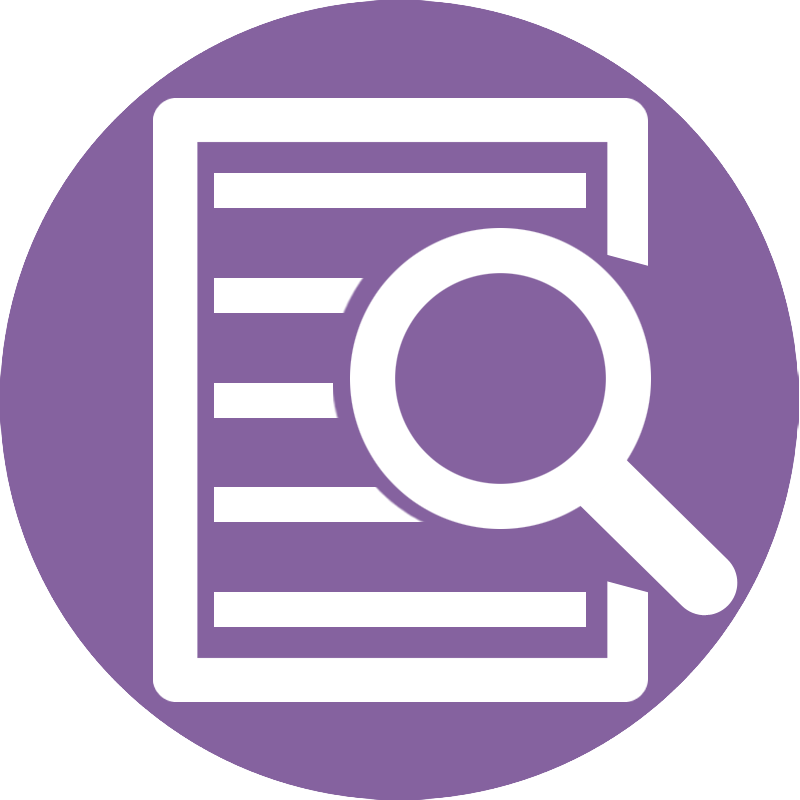 Search line items in the quote to quickly find specific descriptions, prices, quantities, missing price modifiers, and much more. Filter by a specific column to search only that column in the document. Manually override the automatically calculated Grouped Price price to provide a "cleaner" looking price for the group simply by typing in the new amount. This is useful when, for example, your grouped bundle total is $5,043.23 and you would like to present it to the customer as a "cleaner looking" $5,000.00". 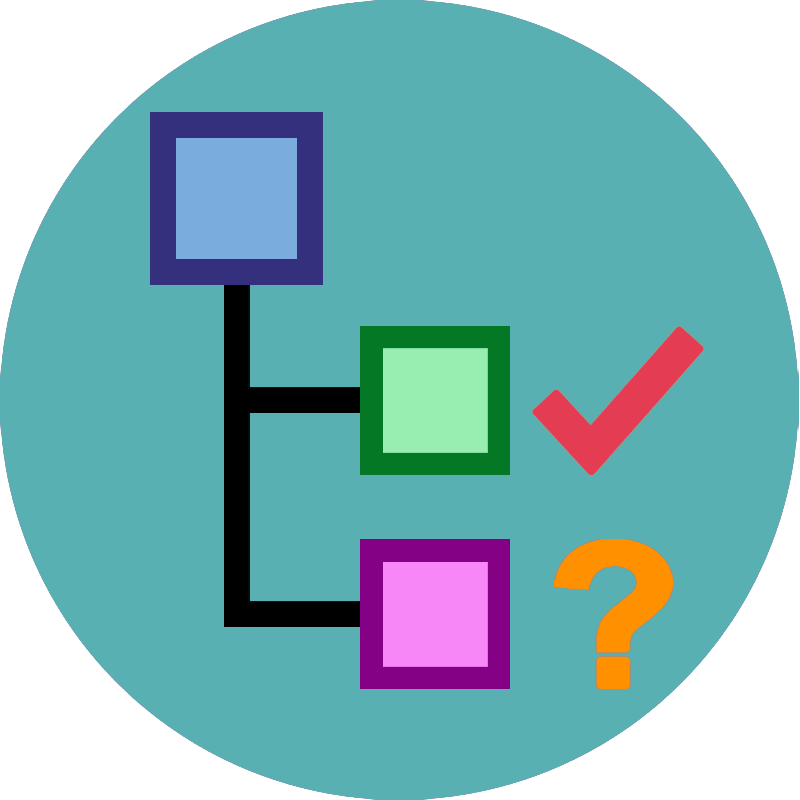 Sort line items on the Document Items tab in the currently open document by ascending or descending, sort items in a group. 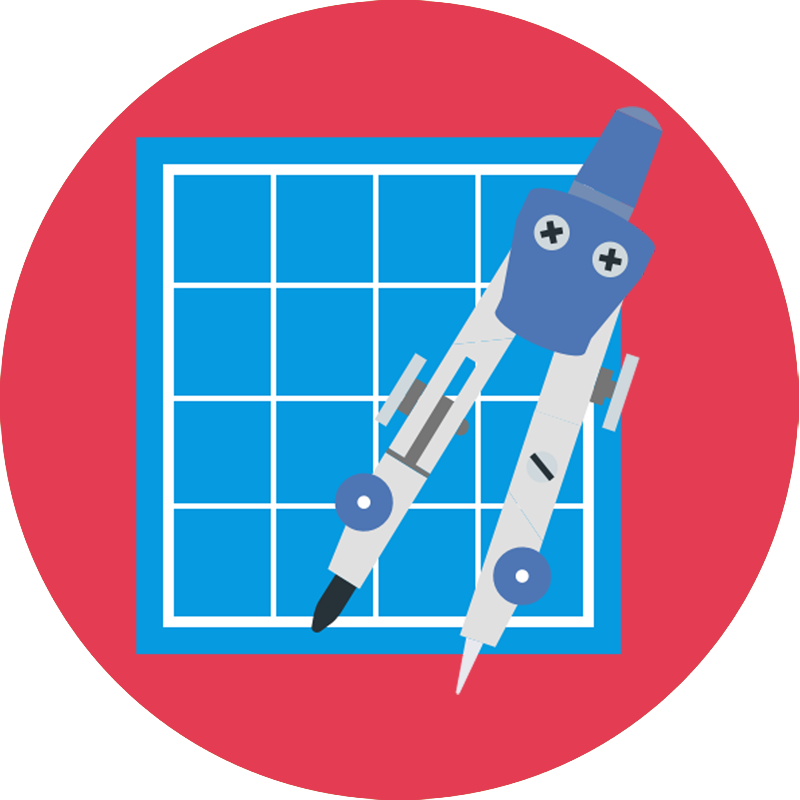 Sort a selection of contiguous or non-contiguous line items. For Autotask, MS Dynamics CRM, SugarCRM and ConnectWise Manage users you can now use the DataLink feature to write information from QuoteWerks into the CRM/PSA opportunity such as notes, custom text information, and much more. This new web-based collaboration tool streamlines communications for each document in a single location. Users can post comments, add documents, invite specific users, and much more. Support for ACT! 21, Maximizer CRM 2019, Sugar CRM 8.2, ConnectWise 2018.6, and Microsoft SQL Server 2019. 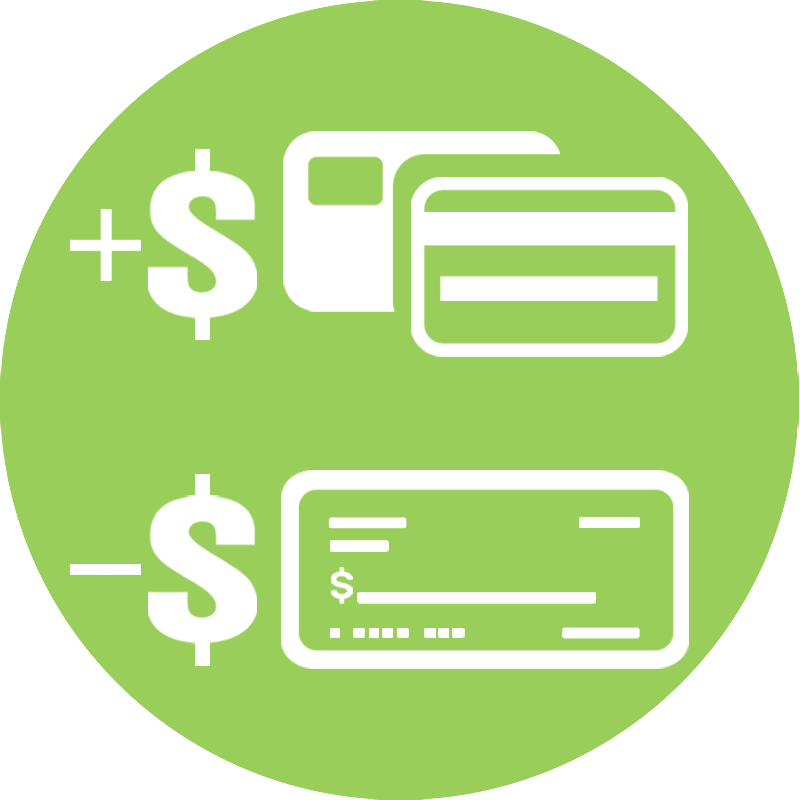 Support for up to seven different payment options (Credit Card, eCheck (ACH), Check, Wire Transfer, and two custom options). 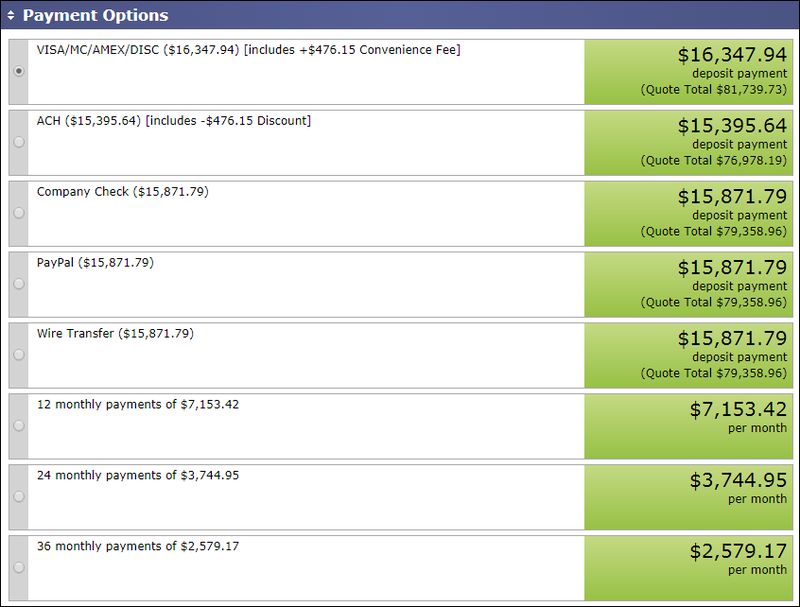 Customize text of the options, add a surcharge or discount, set default payment options and much more! New "Dismiss All" button for the inbox, new "View QuoteValet Users" button on the Logged In Users window, and ability to receive email notifications indicating total number of times a customer has viewed a document. DOCM files are supported in the Deliver window for QuoteWerks. 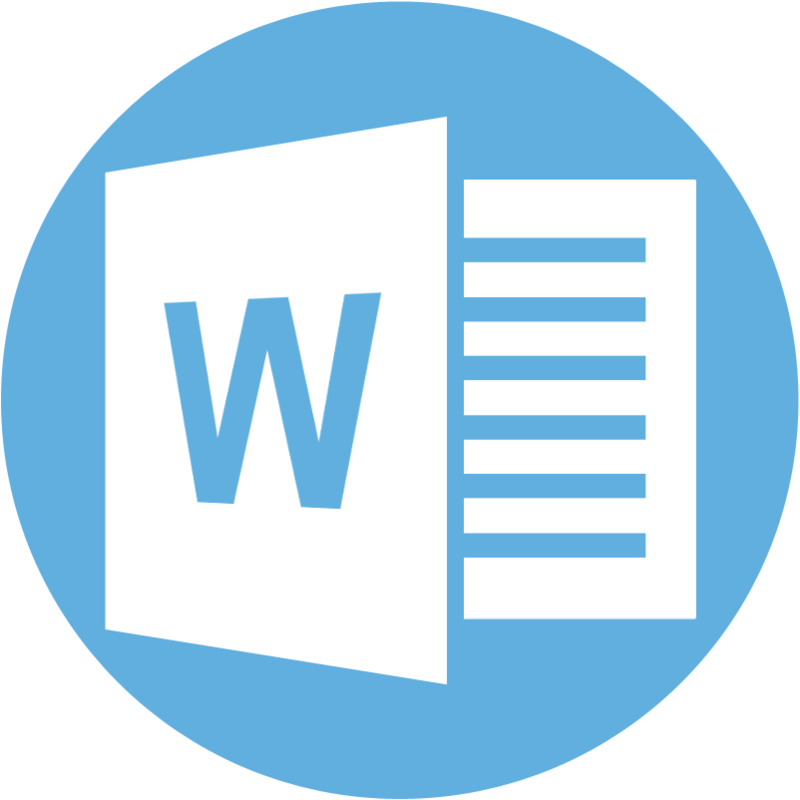 These can be used for creating Cover, Literature, and Layout documents that utilize Microsoft Word Macros. The payment gateway Stripe is now a supported merchant for QuoteValet users. Users can now set Stripe as their payment gateway to collect payments for their QuoteWerks documents via QuoteValet. Added column for extended shipping amount, an option to use extended shipping amount column, an option to set shipping price for items in a product database, and ability to save a shipping template in the FedEX and UPS integration. QuoteValet users can now see which users are currently using QuoteValet licenses and in QuoteValet Insight you can see which users tried to log in, but could not because no licenses were available. Build Release: v5.3 Build 6.06. Some Highlight features are ConnectWise Opportunity Ship To / Bill To Support, QuickBooks Online Payment Receipts, and more. See the complete list of features. QuoteWerks Web is accessed by your favorite web browser and includes many of the great features in QuoteWerks Desktop, including a full support with QuoteValet and Etilize. 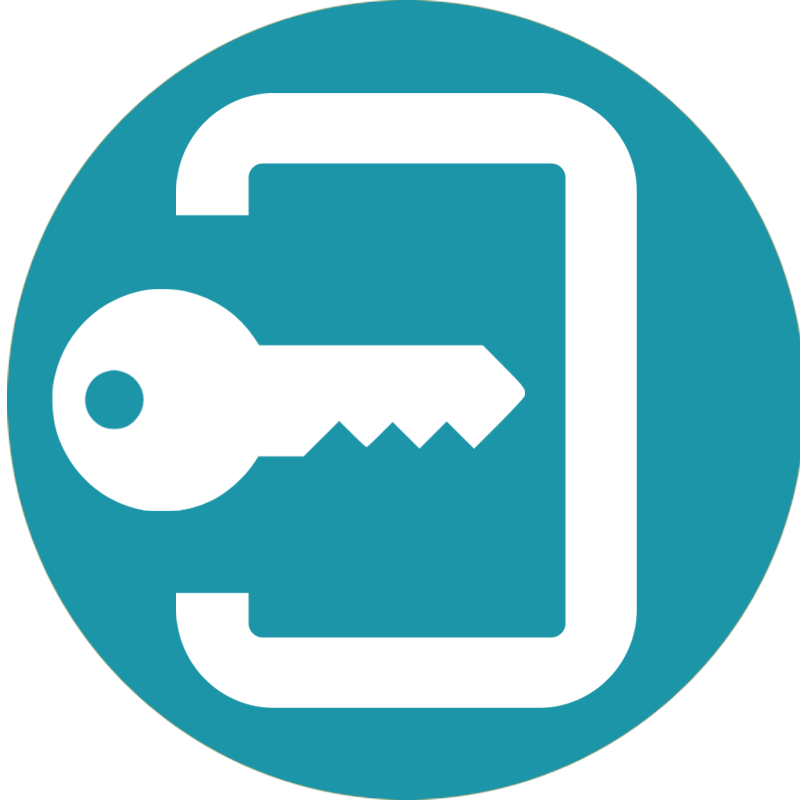 Users will also have access to their existing documents, products and services, layouts, and more! 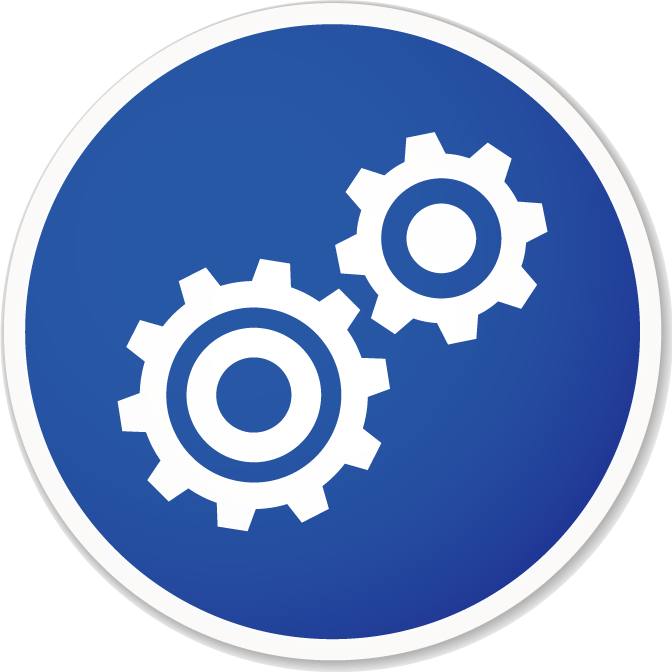 Build Release: v5.3 Build 5.07. 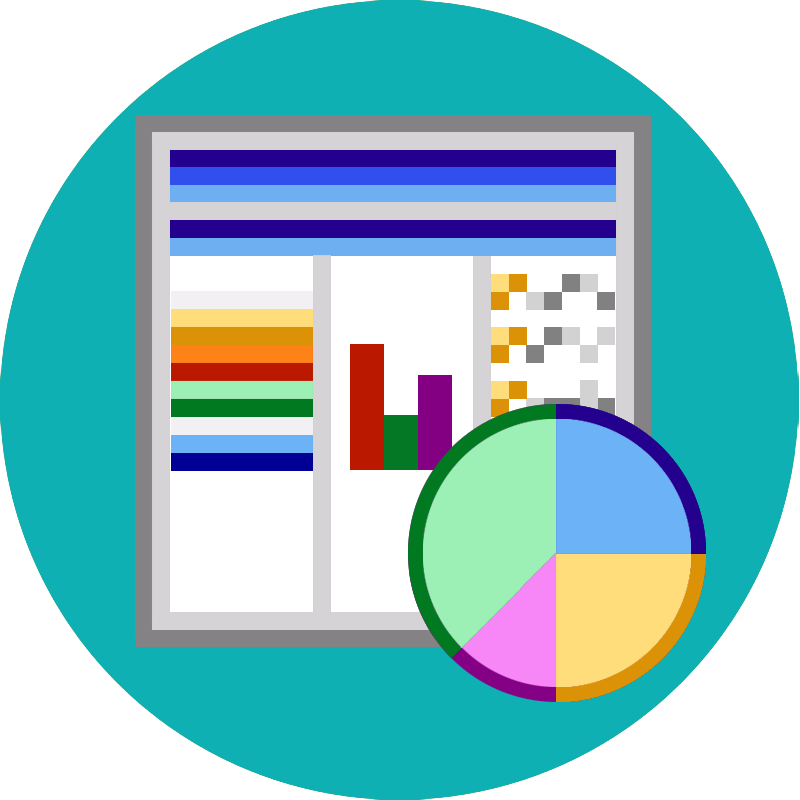 Some Highlight features are Maximizer CRM On-Premise, Open Document search by any item field, Expanded Find Quoted Item functionality, Additional Custom Fields for Products, and more. See the complete list of features. Build Release: v5.3 Build 4.09. Some Highlight features are Improved Payment Options, QuoteValet ACH, Submit Credit Application support for GreatAmerica and Ingram Micro Lease-IT!, Reckon Accounts Desktop, Print Layout file name generation, and more. See the complete list of features. 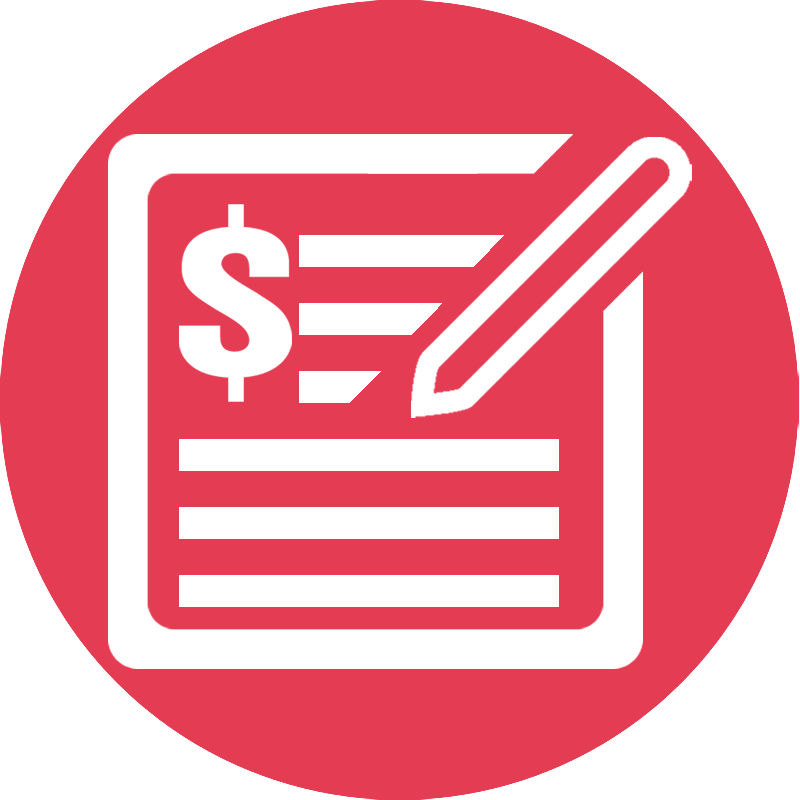 You can specify that a % or fixed amount surcharge or discount be applied to the quote when that particular payment option is selected. Useful, for example, in charging the customer a 3% surcharge if they pay by credit card, or a 3% discount if pay by check, or a $15 fee if pay by wire transfer. There is also an option to automatically disable a payment method, for example, credit card when the quote total is over, for example, $3000. Build Release: v5.3 Build 3.20. Some Highlight features are Maximizer CRM Live, ConnectBooster Payments, Additional Custom Fields on the Workbook, Line Item ExtendedShippingAmount, Email address selection options, and more. See the complete list of features. Build Release: v5.3 Build 2.02. 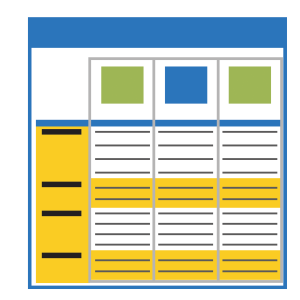 Some Highlight features are API enhancements, ConnectWise functionality, Item Attributes, multi-select print elements,and more. See the complete list of features. 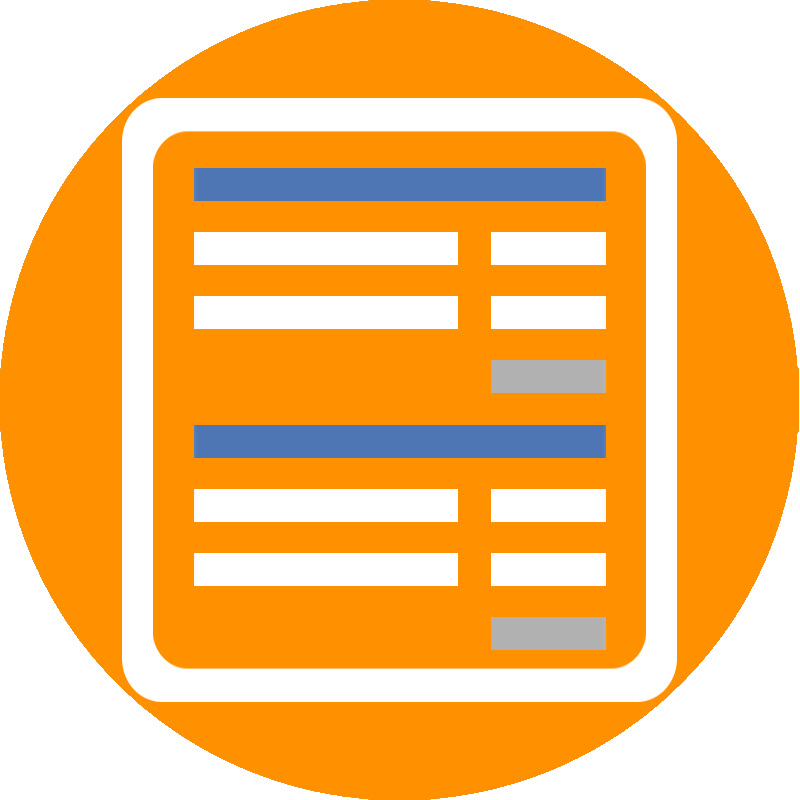 Easily organize your quote into sections to breakdown your quote into project phases, physical locations, item categories and more. 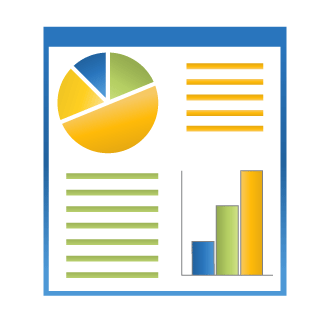 Separate the document into visually appealing and easy to read sections with automatic subtotals. Summary Lines can now display subtotals from sections in addition to totaling items. This is especially useful for displaying totals from a particular Section Header such as monthly, annual, etc. recurring revenue items. 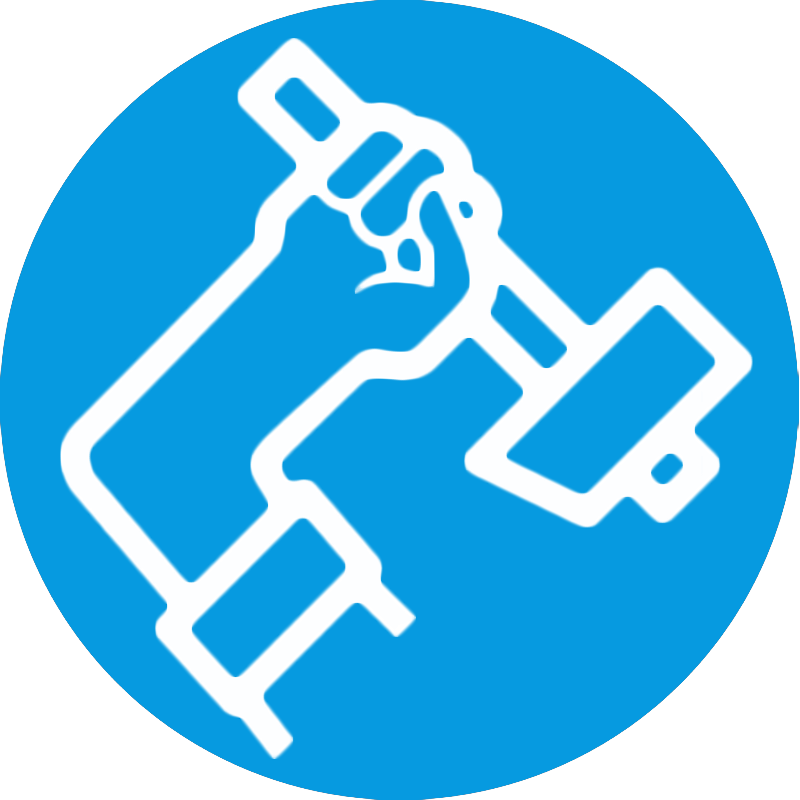 Create and edit required and optional items directly from the Edit Product Window, simplifying using required and optional items in a more intuitive and efficient manner. 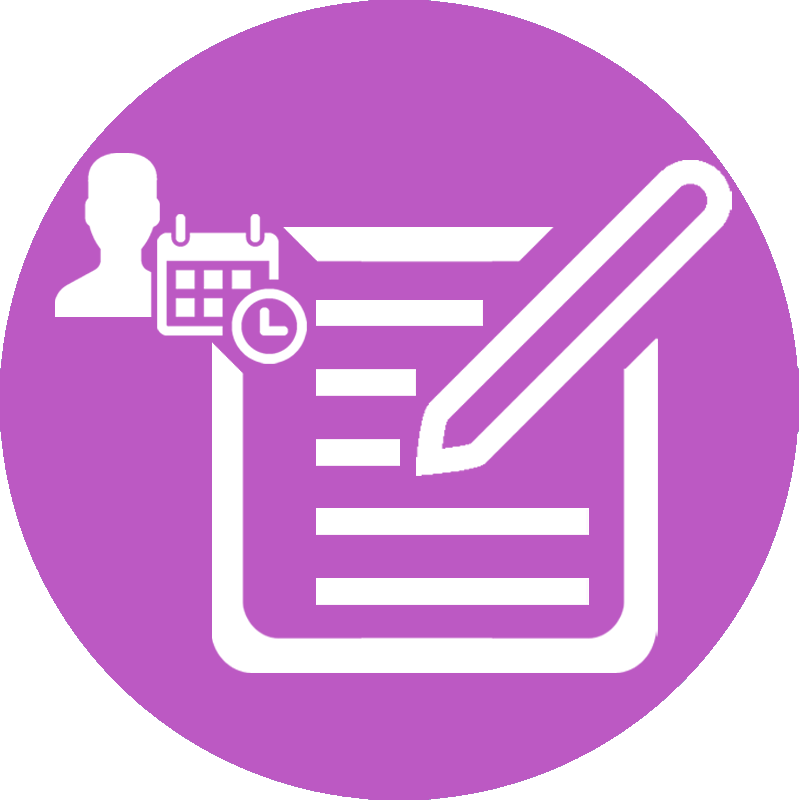 When logging notes in the Dynamic Notes field, your username and time-stamp is automatically inserted. This makes it easier than ever to collaborate and leave notes on the document and know exactly when and by whom the note was added. The QuoteWerks Opportunity Dashboard now displays all of the opportunities for a particular group of users, in addition to individual users. 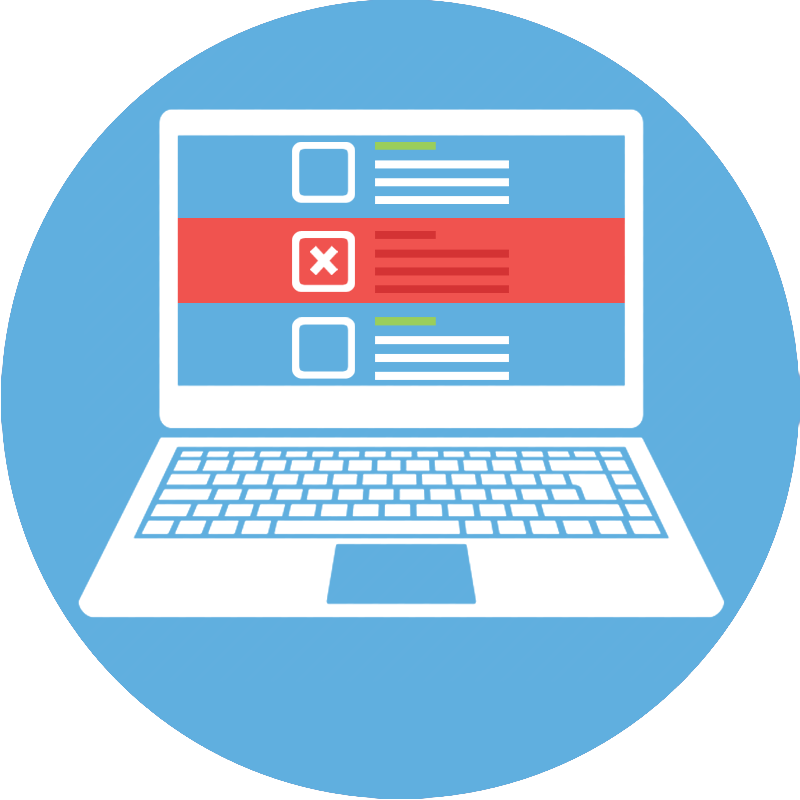 This provides an easy way to quickly report on all open, closed/won, and lost opportunities in the team's sales pipeline without having to run complicated reports. Searching for documents in QuoteWerks is now easier! 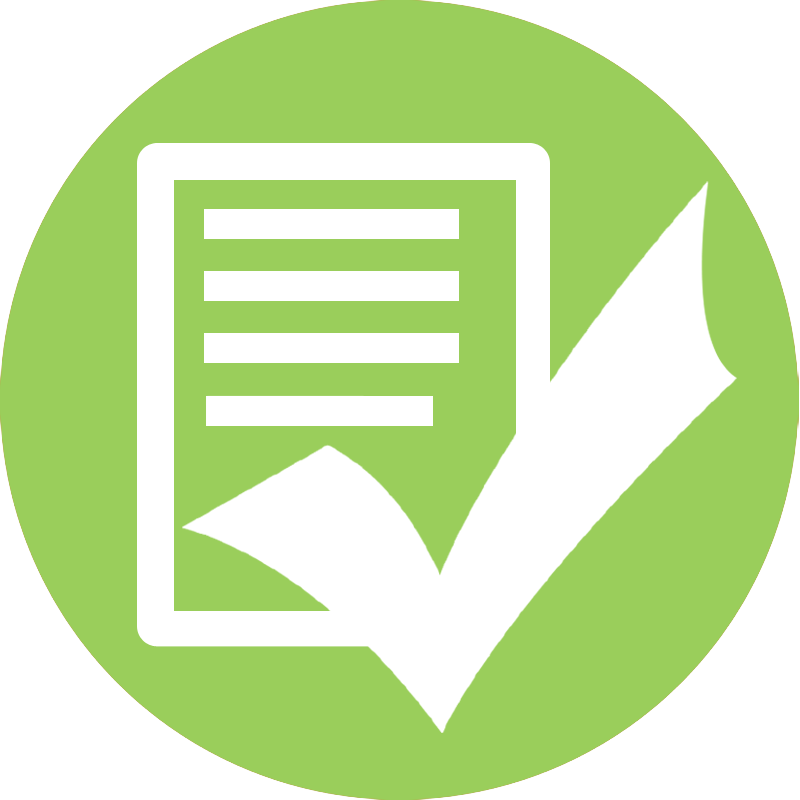 Find documents by drilling down by a particular group or specific rep that prepared the document in QuoteWerks. Required and Optional items now support the link quantity feature so they can also be linked to the master item. Build Bundles and Required Items without having to create the items in the Product Database. Users can now add items to bundles and required items without having to first create the item in the product database. We've refreshed the interface of QuoteWerks to have a more modern look and feel with new icons. QuoteValet supports videos for any document uploaded to QuoteValet. Your YouTube videos can be displayed on the QuoteValet document. 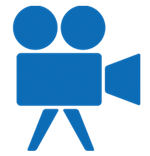 Single or multiple videos can be displayed for a document as well as videos for individual line items. QuoteValet also supports default videos for every type of document (quotes, orders, invoices) created in QuoteWerks so users do not have to remember to manually include videos on documents. Build Release: v5.2 Build 8. Some Highlight features are QuickBooks Online, Windows Authentication Login, QuoteValet Video Support, and more. See the version 5.2 Announcement. New Video: How to Use Agreements in ConnectWise. 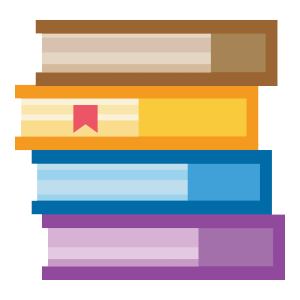 Tip: Did you know that you can drag and drop items in the Quote Workbook? Build Release: v5.2 Build 6. Some Highlight features are Real-Time Ingram Micro Leasing, ConnectWise Enhancements, ability to Modify Purchasing PO templates, and more. See the version 5.2 Announcement. Build Release: v5.2 Build 3. Some Highlight features are International Dell Punchout Integration, Etilize UK Upsell and Similar Items, Leasing Enhancments, and more. See the version 5.2 Announcement. New Video: Version 5.2 Release Webinar. Build Release: v5.2 Build 2. See the complete list of features. 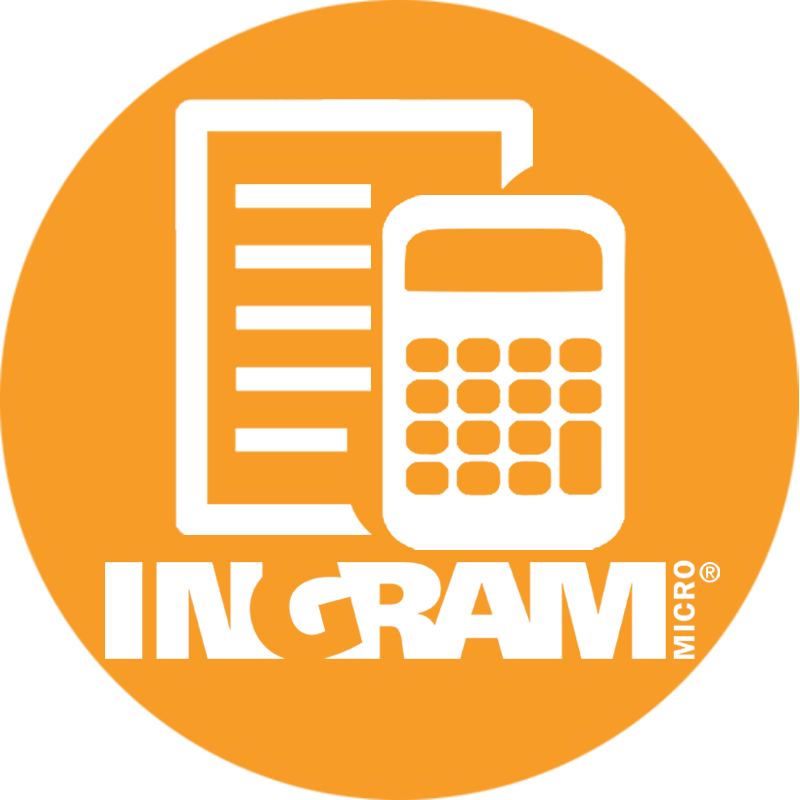 Calculate your Ingram Micro Lease-IT financing options with a click of a button through the new QuoteWerks Ingram Micro Lease-IT Integration. New ConnectWise integration utilizing the ConnectWise REST API. 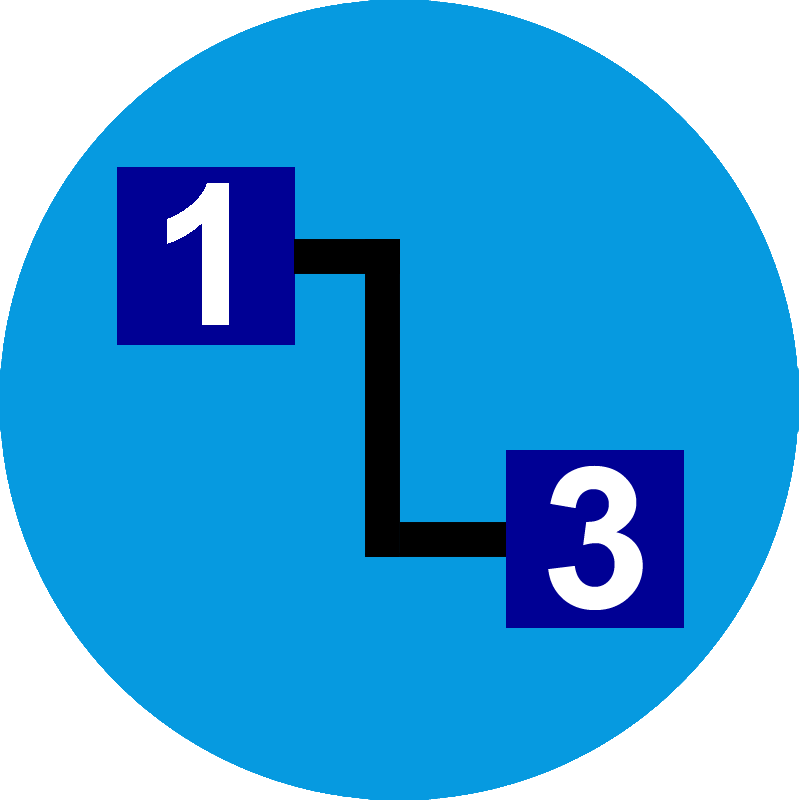 Additionally, support added for ConnectWise 2017.5, 2017.4, and 2017.3. 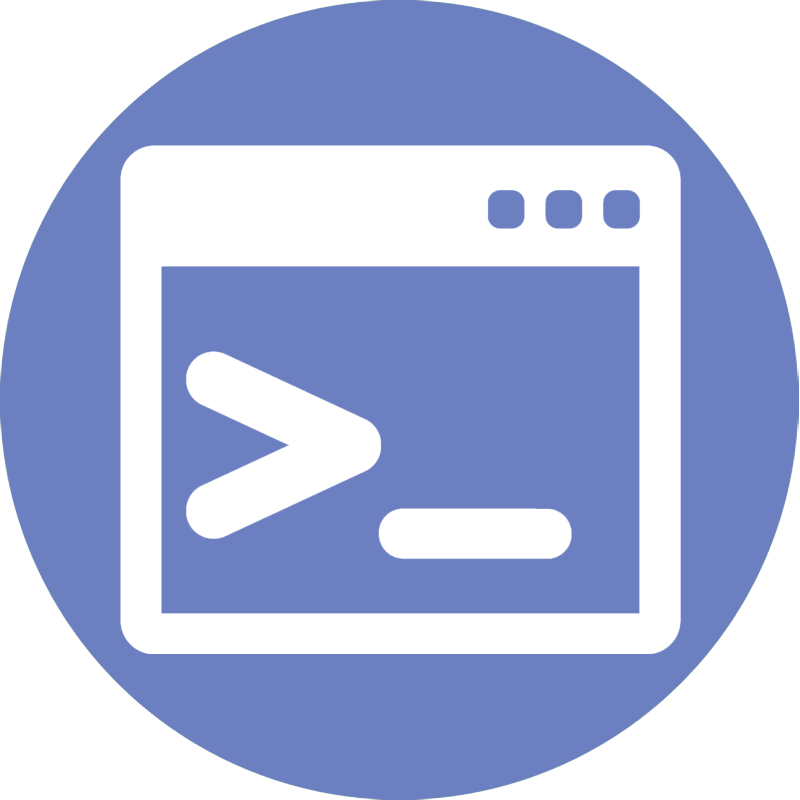 Create, edit, and customize system settings by running multiple commands simultaneously to automate changes inside QuoteWerks. 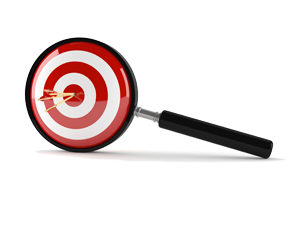 Limit specific items from the Etilize search result for any items that have been discontinued, are outdated, or you simply don't sell. Ensure your QuoteWerks documents are fully branded! 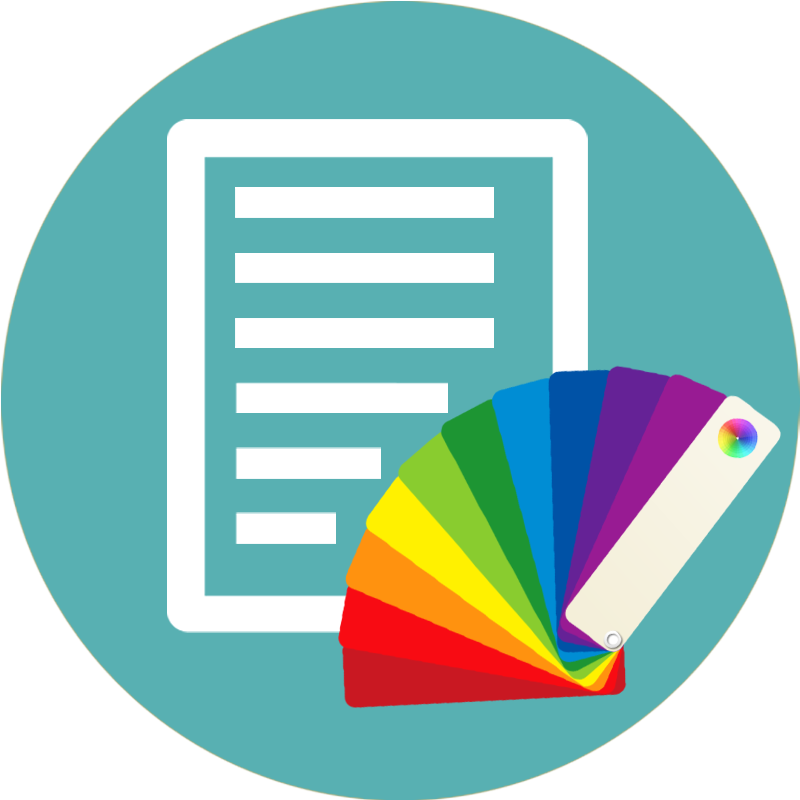 Customize your QuoteWerks Layouts with the exact text color used for your documents in QuoteWerks and never worry about branding again. In QuoteValet Insight, you can see all documents that are approved, not approved, or pending approval on the Approvals tab. 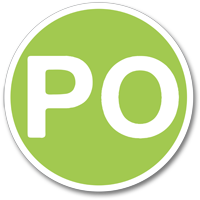 Modify the HTML PO template that is used when emailing or saving a PO as a PDF from the Purchase Orders tab of the Purchasing Window. 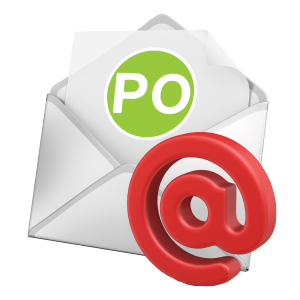 You can easily modify the email template itself that controls what the email looks like. 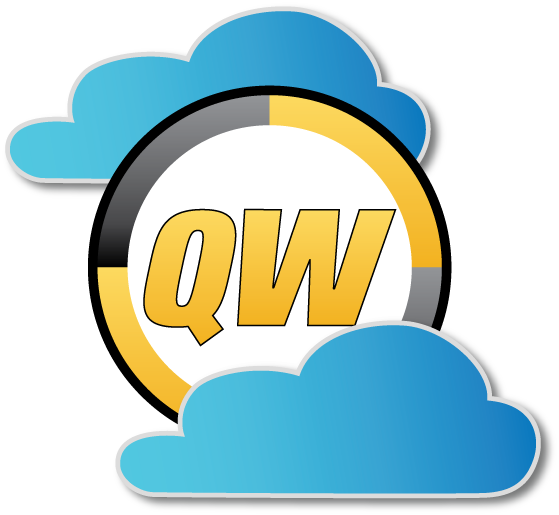 QuoteWerks now integrates with QuickBooks Online in addition to QuickBooks Desktop! 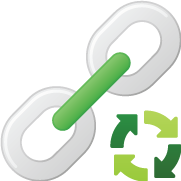 This integration enables users to export their QuoteWerks documents to QuickBooks Online as Estimates, Invoices, and Sales Receipts, includes item support, purchase orders, and much more! 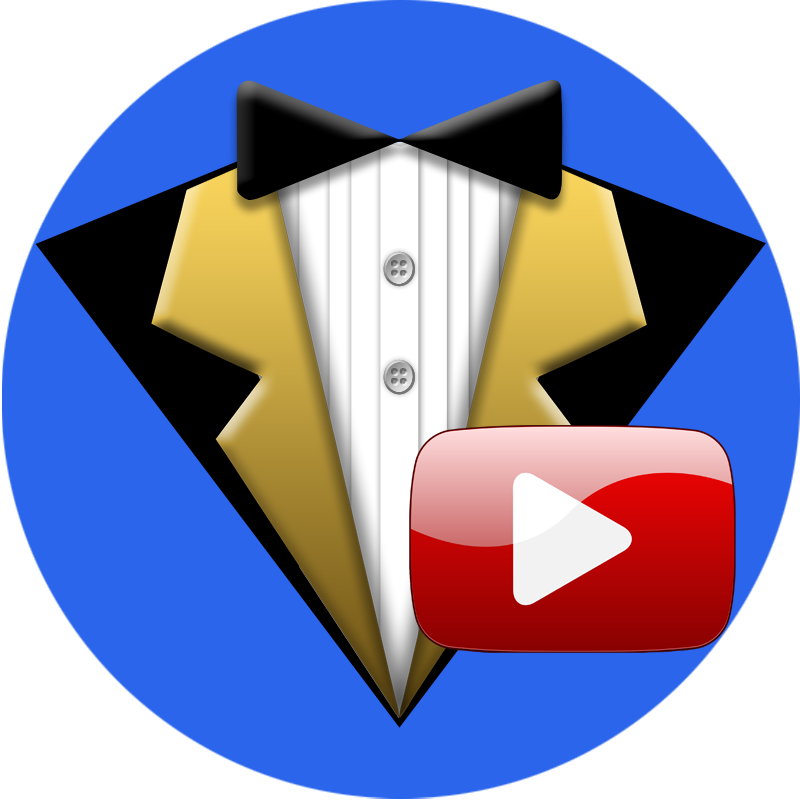 YouTube videos are supported for QuoteValet documents and individual line items! Share single or multiple videos on a document to help explain the line items in the document, introduce new offerings, or simply provide more information about your company. Users can now have more than one QuoteValet Order Template used by the QuoteValet Shopping Cart. When uploading a new Order Form template to QuoteValet you can choose which of the available Order Form Templates to use. 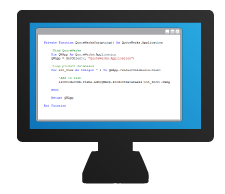 Automatically log-in users into their QuoteWerks installation using their Windows login information. This feature enables any user to auto-login into QuoteWerks without having to remember their password for QuoteWerks. 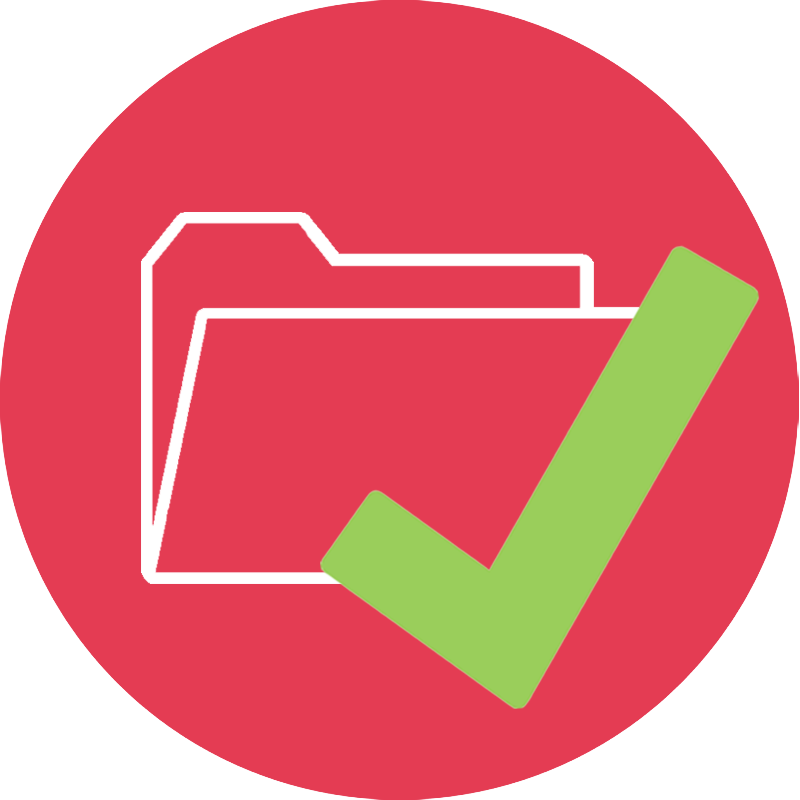 Save commonly quoted items from Etilize in a My Favorites folder. 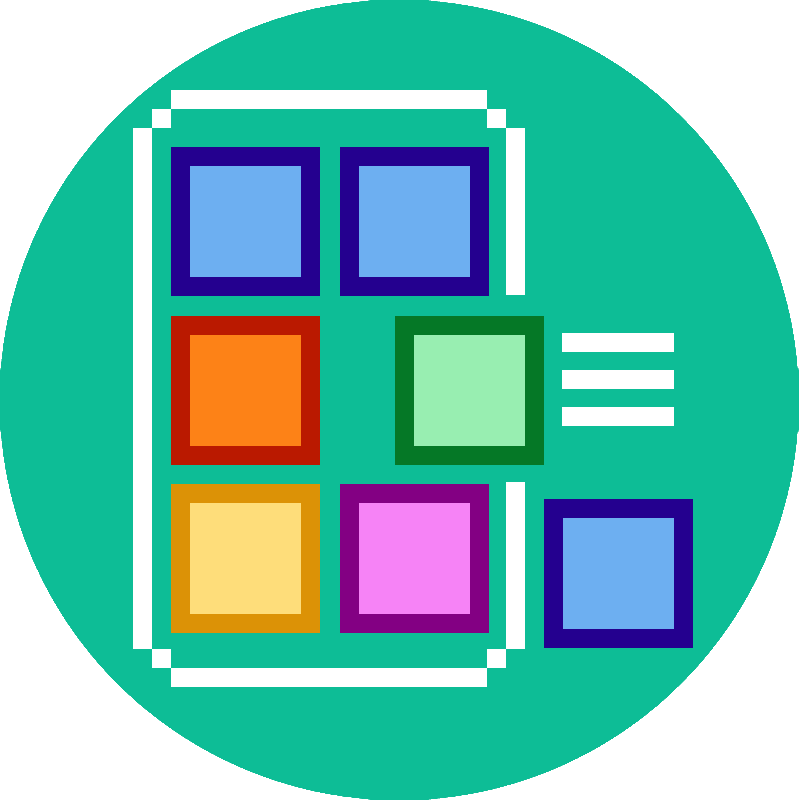 Create and add items from Etilize to Bundles and Configurations. 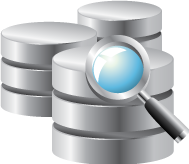 View, search, open, and import Tech Data created quotes into QuoteWerks. Export Management Reports to delimited text files (CSV or .txt) and select which fields to export. 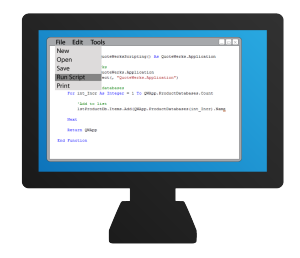 QuoteWerks now has built-in VB scripting in the Corporate Edition which enables you to write code to extend the functionality of QuoteWerks. 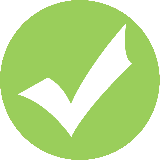 Do special validations, check for combinations of items, and more. 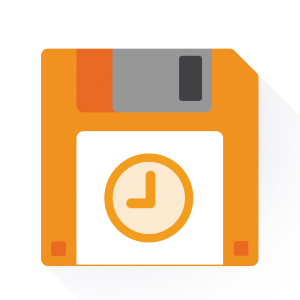 QuoteWerks is the only quoting software with multi-level Undo and Redo. There are 10 levels of undo. Sometimes the simple things are the best. The QuoteWerks Dashboard gives a high-level overview of your total dollar amount and number of quotes and orders from the current month, last month, and two months ago. You can also see quotes expiring within the next week and even handle ConnectWise quote-request notifications. Use your Google Contacts as a CRM source in QuoteWerks. 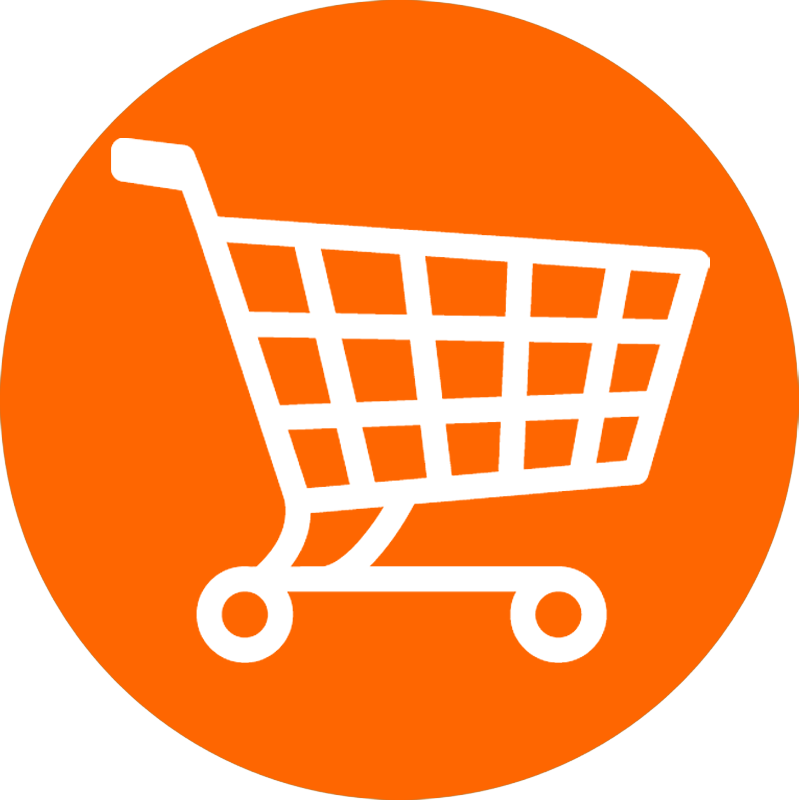 Purchase Orders can be created in QuoteWerks that are electronic orders or manually created. When creating a new quote and selecting the contact you are creating the quote for, any active quotes for that contact will automatically be displayed in the Active Quotes Panel. This ensures that a colleague hasn't already created a quote for the prospect. 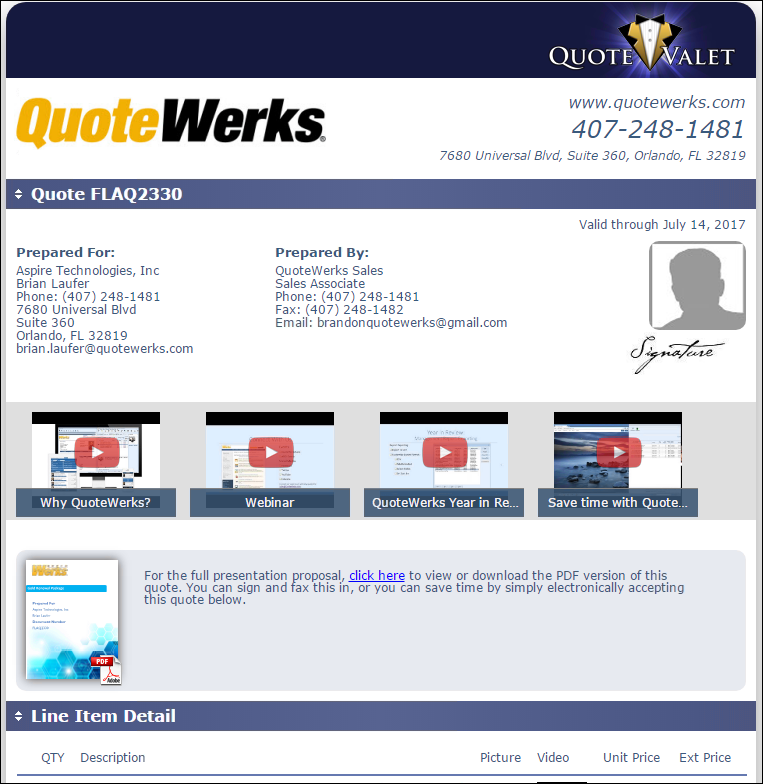 As a result of the collaboration between QuoteWerks and Tech Data, QuoteWerks retrieves quotes created by Tech Data sales reps directly from Tech Data's internal SAP system. 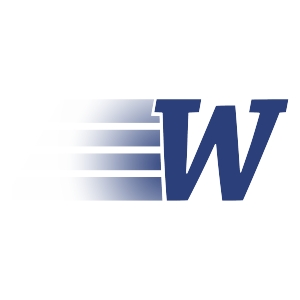 Place Electronic Orders with QuoteWerks and have the Purchase Orders flow seamlessly to ConnectWise. Use your CRM for Quoting and ConnectWise for Orders. Initiate a new quote from a ConnectWise (Mobile) Opportunity. 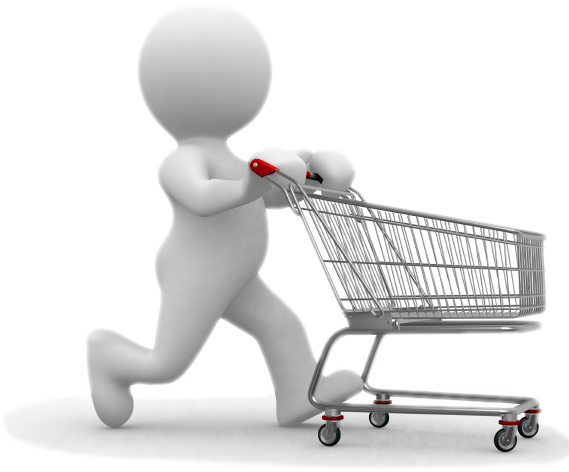 Create online order forms with the QuoteValet Shopping Cart. 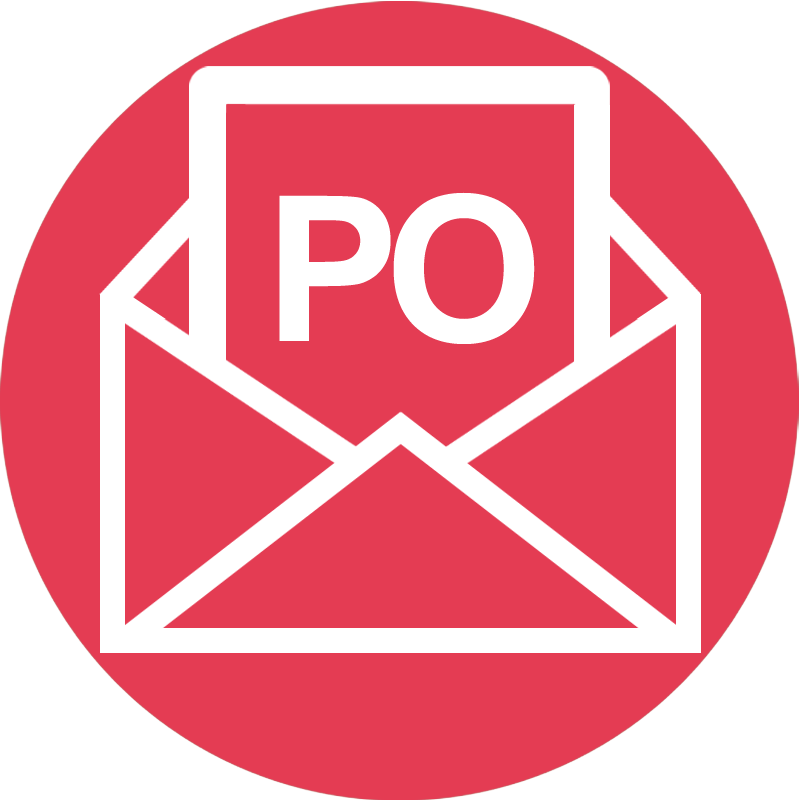 Use them to automate customer re-orders or receive paid orders from a promotional email blast. 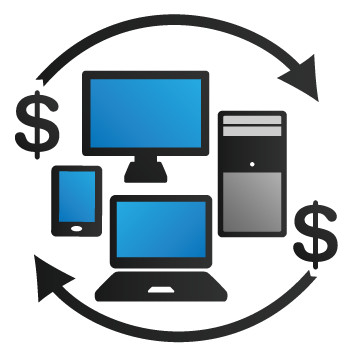 Our complete Distributor Integration retrieves your pricing & availability, places electronic orders and tracks your shipments, serial numbers, & receiving. 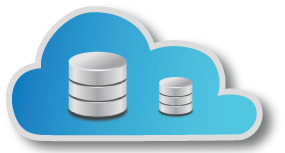 Our new Microsoft Azure integration enables you to host your QuoteWerks Product Databases in the cloud. It can be tough keeping up with all the new parts on the distributor websites. 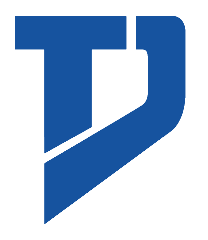 Now, QuoteWerks provides you with ALL the parts from D&H, Tech Data, Ingram Micro, & SYNNEX with the Product Content Subscription. 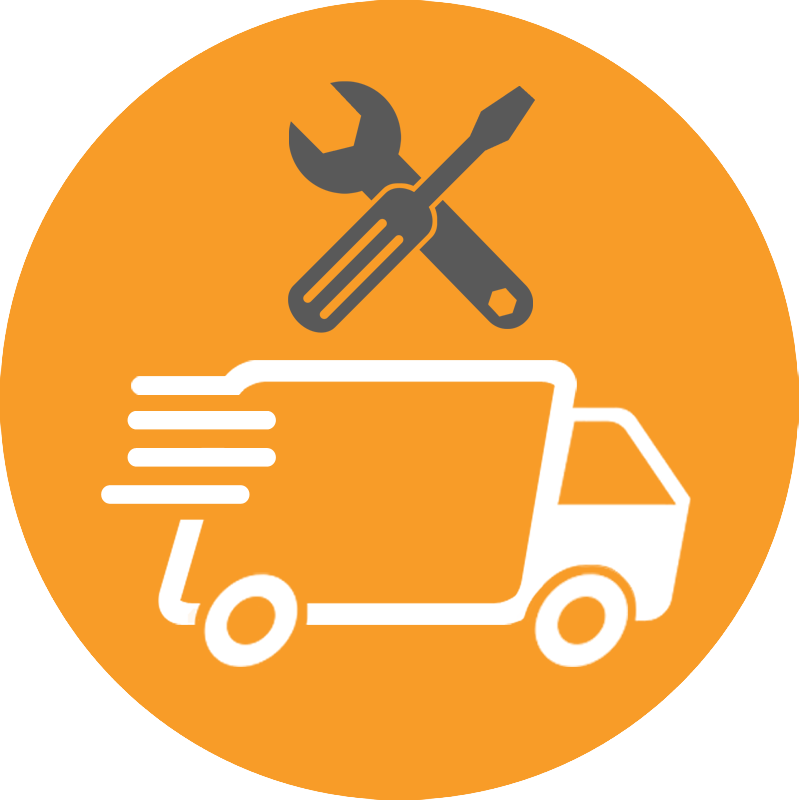 Our shipping integration with FedEx and UPS enables you to obtain real-time shipping quotes from your carriers, & serial numbers. 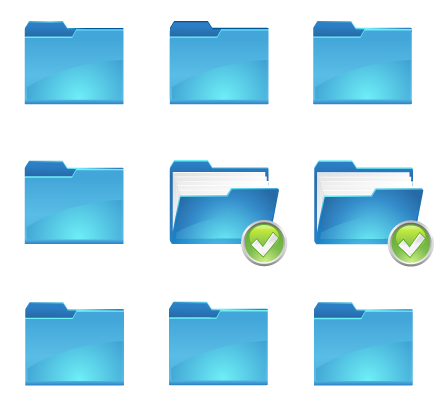 Audit Trail Tracking provides the history of key event changes to the document, who changed it and when. 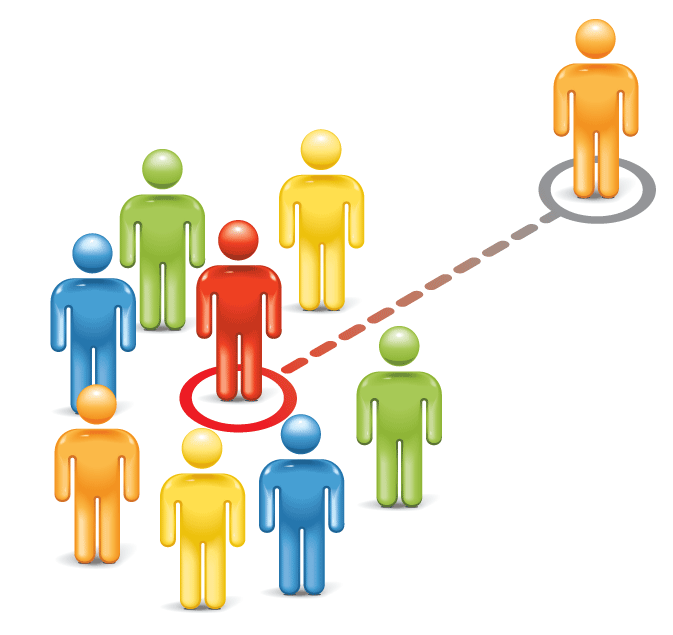 Grouped Bundles on the quote can be converted to a single recurring monthly revenue amount. All of the individual items in the bundle are totaled and then you can set an Annual Percentage Rate (APR) and a Term like 24 months at a 20% APR. This feature can be used for Hardware as a Service (HaaS) quoting. Present rounded prices to your customers. 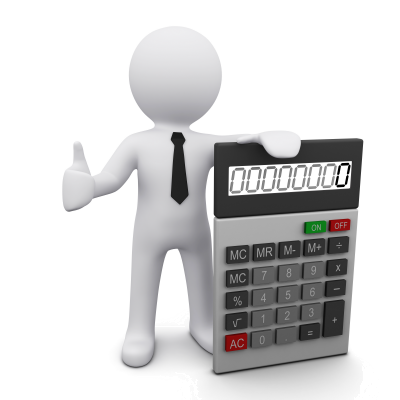 Easily round your prices when calculating from cost or list. 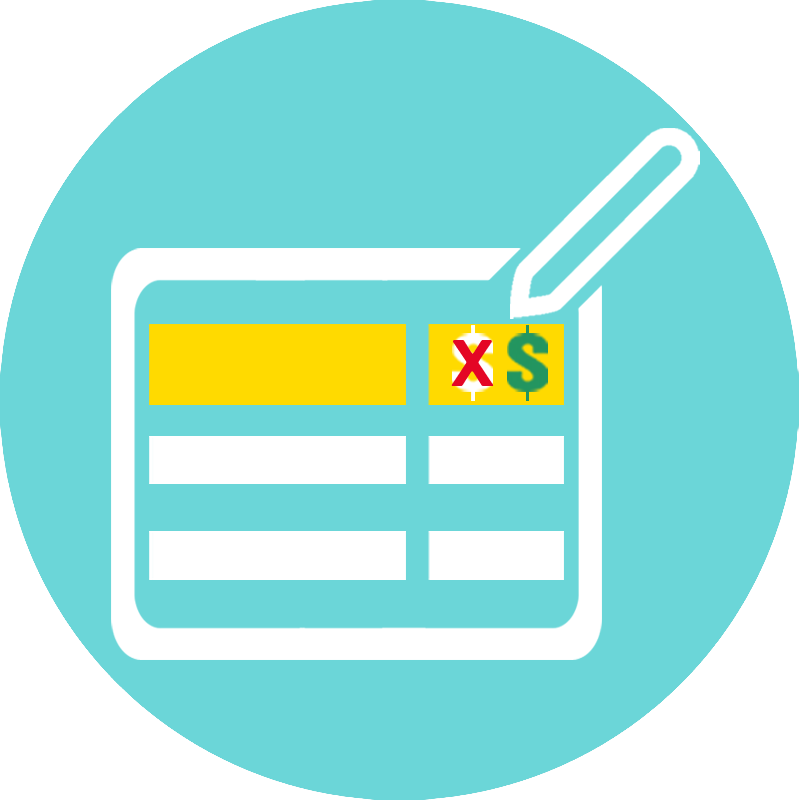 Import the Price Quotation spreadsheet your Tech Data sales rep emails you in a single click. Another QuoteWerks Original. QuoteValet 1.3 now includes Credit Card processing. Collect deposits, progress payments, balances, and payments flow seamlessly into QuickBooks. QuoteValet is the online quote delivery and acceptance vehicle for QuoteWerks. QuoteValet is a more robust way to deliver quotes to your customers and prospects. QuoteValet is an additional Subscription. The QuoteValet add-on subscription for QuoteWerks gives you the flexibility to create quotes on the go. 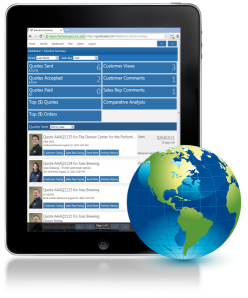 QuoteValet Mobile enables you easily create quotes on your iPad or any HTML5 compatible tablet or browser. Imagine being able to create quotes in minutes and email it to your customer while still in your customer's office. QuoteValet 1.3 payment processing is available for over 80 gateways including QuickBooks Merchant Services, Authorize.net, PayPal, and more. 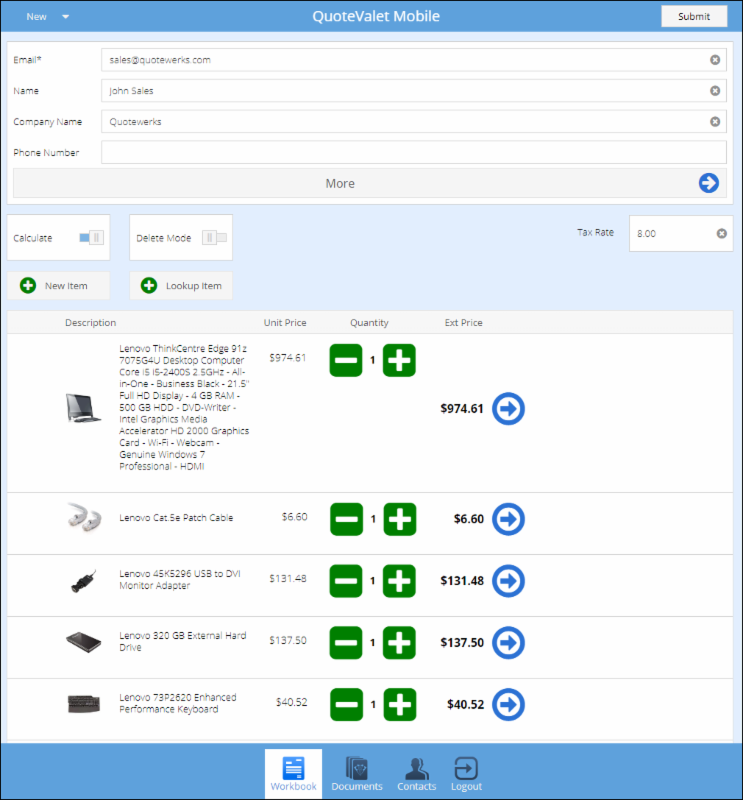 Etilize 2.0 now presents spec sheets and accessories, enabling you to up sell your customers, generating more revenue. Etilize 2.0 adds support for UK QuoteWerks users in IT and AV industries! Tax Rate Lookup service is now included free in the Real-Time Module. 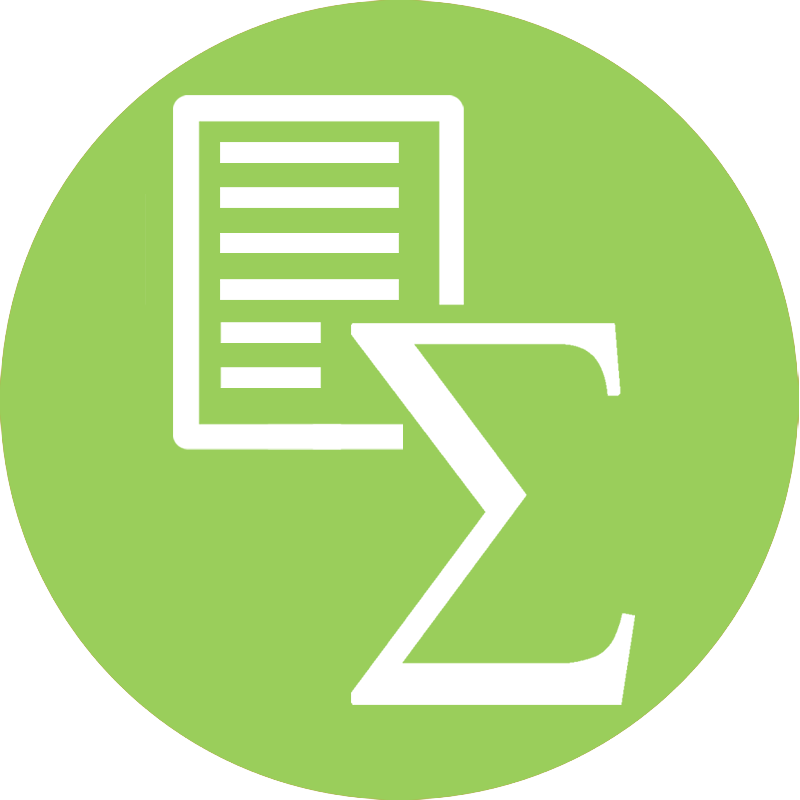 Retrieve sales tax rates for your customer's zip code & city. The QuickBooks integration now creates Purchase Orders, Payments from QuoteValet 1.3 flow seamlessly into QuickBooks, and QuickBooks Custom fields (estimates/invoices/sales orders/POs, items, etc) are now supported. 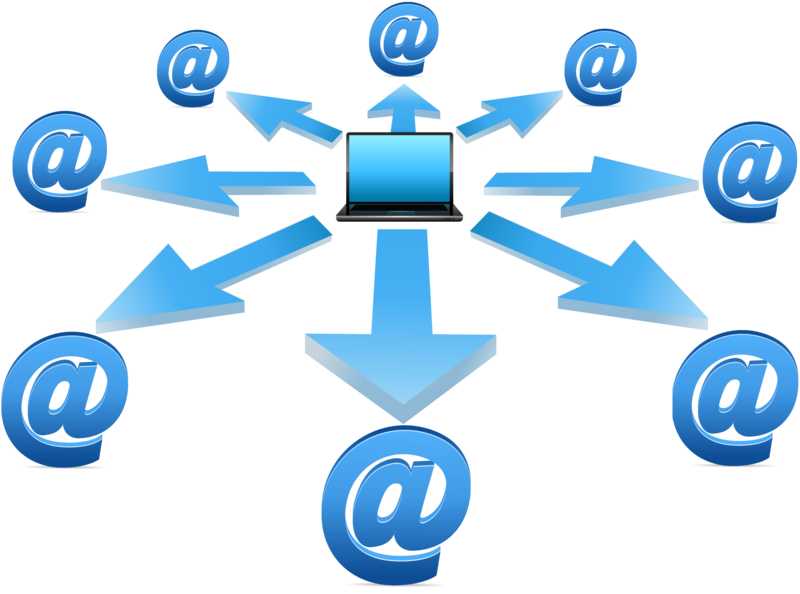 Send the same email out to multiple recipients without the recipients being able to see each other's email addresses or names. Associate Pictures with items "on-the-fly"
You can now manually associate a picture with a line item on the Documents Items Tab of the QuoteWerks workbook. Previously, this would only happen through Etilize or through associating a picture in advance in the product database. 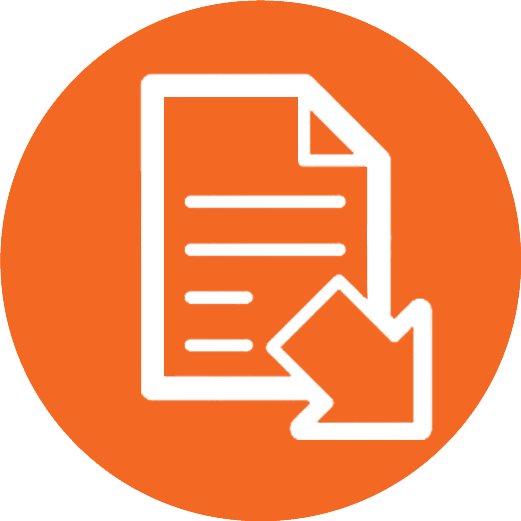 QuoteWerks now attaches a PDF of your quote/proposal automatically to your CRM. 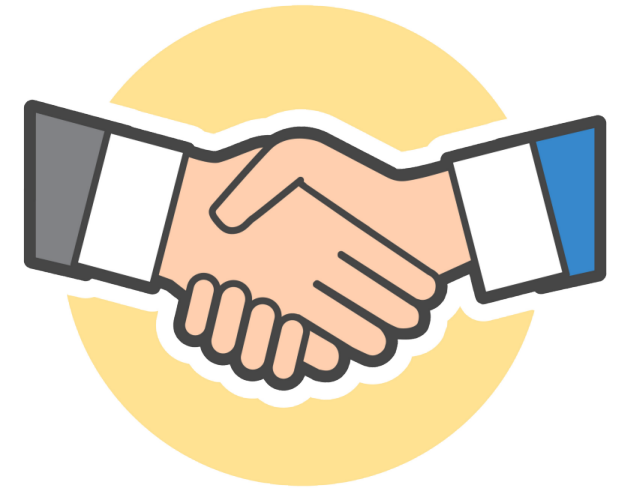 This new feature is supported in all of our native CRM/PSA integrations, which include: ACT!, Autotask, ConnectWise, GoldMine, Outlook, Outlook BCM, MS CRM, Maximizer 10+, salesforce.com, SalesLogix, and SugarCRM. The new Inbox tab on the QuoteValet Dashboard is designed to help you stay on the top of all your pending quotes by providing one place to see all new notifications. The inbox tab will display only new notifications, giving you the flexibility to see all important notifications in one place. The QuoteValet reporting functionally has been enhanced and can be found on the new Reporting Tab on the QuoteValet dashboard. The QuoteValet Reporting allows you to filter your pending quotes to easily see new opportunities and keep track of details. The QuoteValet document activity history is now color coded to easily distinguish between customer and sales rep activities.